Welcome to my blog and the My Craft Spot blog hop!! I am so glad that you are joining us and I hope that you are gathering some wonderful inspiration from each of my fellow and very talented design team members. How have you liked the new stamp release?? Aren't they fabulous?? Did you see the wonderful projects that have been shared all this week on the My Craft Spot blog featuring the new stamps?? If you haven't, hop back to the My Craft Spot blog after you have completed the hop and scroll through all of the posts for the week to see lots of eye candy. I have two projects to share with you today plus a giveaway. This first one is a card made with the Candy Corn Kisses stamp set that you can have a chance to win by leaving a comment on this post (details below). I used the Wrap It Up cartridge to cut out the witch image and Elegant Edges for the green label. I embossed the label with my Cuttlebug and inked it with some black ink. Next up is a project with the new Happy Fall! stamp set. I thought that it would be fun to make some place cards for my family this Thanksgiving. I used the Thanksgiving Season cartridge to cut the tags and the turkeys, corn, and hats. The letters for the names are cut from the Boys Will Be Boys cartridge. Here is the list of the design team member's blogs along the blog hop. If you didn't start at the beginning, hop over there first to get all the details and to see what Kimberly has created and then hop on to each of the other design team members blogs. Don't forget to leave comments along the way because at every stop, you have the chance to win a new stamp set on each of the blogs, courtesy of Kimberly at My Craft Spot. 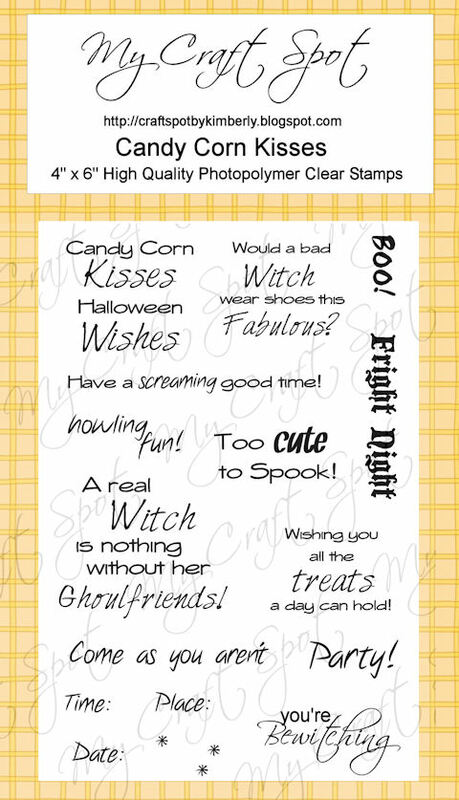 *****How to enter for the super cute Candy Corn Kisses stamp set below.......Leave your comment on this post and tell me which of the four projects I have shared this week, with the new releases, is your favorite. You will have until Monday night to get your comments in. I will announce a winner on Tuesday August 30th. Now, hop on over to Joy's blog to see what she has created to share with you. Have fun!! Wow, Amy!! I love your cute place cards and your witch card is absolutely stunning! The witch is super cute and I love how you inked everything!!! I think my favorite is today's glittery witch...wow...she is amazing! Thanks for the give away. You did a super job! I love the witch card (especially the sparkles) and the place cards for Thanksgiving. My absolute favorite project of your this week was the Monster Boxes. I'm hoping it's okay to scraplift these. I'm a kindergarten teacher and we have a "Monster" themed week the week before Halloween... my little kindergarten friends will be in love with these! Having so much fun on the blog hop! You did an amazing job on all your projects! I love the place cards! Would make such an excellent addition to the Thanksgiving table! Awesome job on your projects!! :) I love the bewitching card and of course the place cards!! :) What great inspiration! I love the monster bags with the Candy Corn Kisses stamp. Too cute! This is a darling card, Amy! I love the harvest blessings card. Those heart apples caught my eye first thing. Outstanding Job, so creative you are! My favorite is definitely the place cards they are super Cute I love them!! O btw I am now a new follwer of your blog! TFS!! The seating cards are ADORABLE! That witch is so cute, love that card! Love the projects you made today and all week!! I really liked the monster bags and these place settings!! Great job, thanks for the chance to win!! Like all. If I have to pick a fav then it would be the sparkle glitter witch. Thanks for chance to win. Amy, All your projects this week have been great but I am a big halloween person so I think my favorite is going to have to be the witch card this turned out so cute. I love all the detail that went into it. What great projects, Amy!! Your witch looks terrific with all that glitter and I love the spooky embossed swirls behind her! Your name cards look wonderful too. That font is just perfect with them! Wow! Awesome card, lovin' this witch and the place cards are super cute! Great idea too:) TFS and for a chance to win! Amy, I so love your "you're Bewitching" card. The glitter on the witch is awsome. Makes that cut pop!! The more I see done with the stamp set the more I am thinking I might need it!!! Such great projects to release these stamp sets. great job!!! My fav is the monster treat bag!!! I like the the place cards you made today, but my other favorite is the apple heart tree. Very sweet. Love your project. I my favorite project is Witch card. I love how you add glitter to the dress and hat. Like how you add black ink to the label. Fantastic projects! Both are great, but love the place setting name tags for parties. Great idea. It's hard to just pick one project.... but I must say your Monster bags are super cute! TFS! All your project have been AMAZING this week! 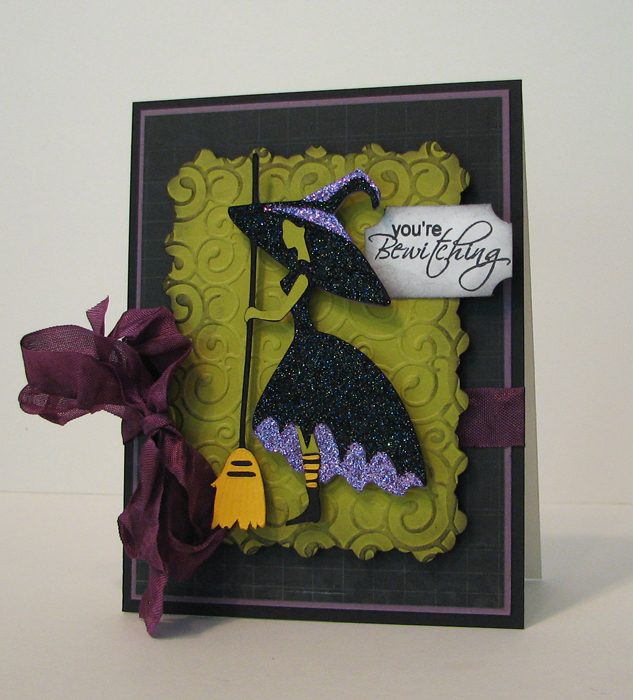 Love your "Bewitching" Card! Love how you used the Stickles for the dress! Your place cards are soo adorable! Great Job! Love your witch card and such elegant place settings.My fave project of the week would have to be your harvest tree,I adored your glossy hearts. All of your projects this week have been awesome. But I will have to say that my favorite has to be todays witchy card. Fantastic!! WOW! I love that card with the glittery witch! And the place cards are so pretty....I am thinking I am going to do something like that this year! My fav project you did is the heart apple tree (although they all were wonderful) I just love the way the Glossy Accents made the apples look! Thanks for the chance! I think the witch is my fav! I love how you emossed the label, so cool!Ido love the treat bags too!! Amy, these are fabulous! I just love that little witch! She's so cute! 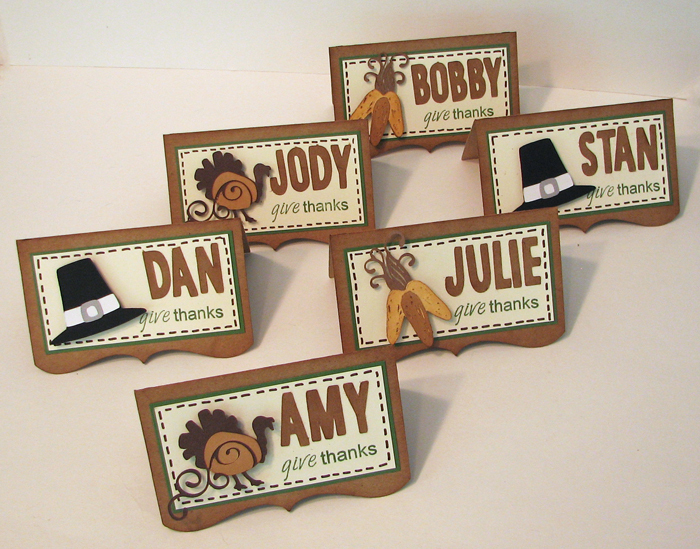 And the placecards...oh my, how they will set off your holiday table! Wonderfully done! Oh both of these projects were so fun! I love the witch! She is just beautiful and then the placecards will be great for your Thanksgiving table! thanks for the change to win some awesome blog candy! I'm thinking the witch card is my favorite!! Then again, it's so hard to choose! I'm enjoying learning more about the craft through all your cute ideas and helpful tips. fantastic projects...love them all. i can't wait to get crafting for halloween...super cool. all your projects are great, I really love the "Bewitching" card, fantastic!!! Great projects! Can a witch be pretty? She is so sparkly and pretty! You always do such an amazing job! It is very difficult to pick favourites on this blog hop! The talent is out of this world!!! However, I love your bewitching card!! I am definitely going to be coming back to scraplift your projects. Thanks for the inspiration!!!!! WOW, Amy. LOVE the added sparkle to that adorable witch card and your place cards are just too cute! Thanks for sharing with us!! I love the bewitching project. That witch cut is to die for! I love all the projects this week. Such creativity. The witch is awesome. I liked all of your projects this week, but my favorite was the Harvest Blessings card with the hearts as apples! It was too cute! I've liked all of your projects this week, but I love this witch card. It reminds me of the musical "Wicked." One of my favs! Thanks for all your hard work. OMG Amy! All your project this week have been outstanding as always. You used the stamps so well to go with each project. Mt favorite is the witch card to day, I had no ideal that beautiful witch was on that cartridge. TFS! Wow, both your projects are fabulous. I love that witch cut and the place cards are so elegant. Candy Corn kisses is my favorite, I hope I win!! I would have to say your Happy Harvest from Wed. would be my fav. Honestly, i love your place cards in today's post! I've been eyeing place card ideas & I love that these are simple, yet so festive! Definitely the witch card! All the projects are cute, but the witch card wins it hands down! I love everything about it, especially the Stickles!! Thank you for the opportunity to win. I love love love the witch card, you did an awesome job. The whole card is amazing. You made me want to get that cartridge because I dress up like a witch every Halloween. I am your newest follower also. 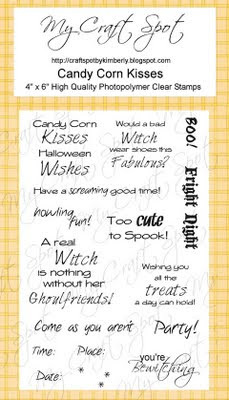 Love Love these stamp sets and yout projects are wonderful...I especially love the the witch card!!! Love all your creations...its hard to choose a favourite. I really love the 'give thanks card' with all those hearts. Its me again...I got mixed up its "Harvest Blessings"...sorry! I love these stamps and can't wait to try them out! I love the Harvest Blessings cards if I I have to pick but they are all awesome!! I know you asked for "a" favorite but I have 2. I love the place cards and the harvest blessings. Those heart apples are so cute. i just love "you're bewitching" card. tfs. Amy, these are so cute! I love them both the witch is awesome. Great projects. I love that card. the colors are awsome. halloween is my fav! what cart is the witch from. i like it! Hi Amy! Your projects are fabulous! I especially loved your Harvest Blessings card. The hearts for the apples was a very sweet idea! I love the place cards! Great idea for large family gatherings!! 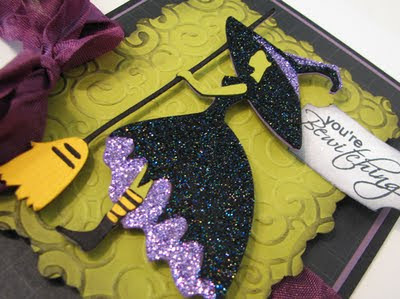 I just love the You're Bewitching card it is so beautiful the colors and details are great you are such the artist. I love all your designs. Cant wait to see what you make next. Your projects are fantastic so I became your 999th follower! :0) I loved all your work, but my absolute favorite is the witch one from today. I am a sucker for a really good witch! ;) TFS and for the chance to win! my fav out of the four this week was your harvest blessing card - the tree and the apples are too cute!!! I would have to say this witch card is my favorite from the week! I love that sentiment and the stickles on her is fabulous!! The place cards are beautiful! Great job this week! Such fun projects!! I just love the "Happy Fall" set....hard to choose just one tho' really! All your projects are wicked awesome! Love the stamp set too! :-) Thanks for sharing! My favorite is your tree card with the glossy hearts, all of your projects are great! Thanks for sharing! LOVE your Bewitching card! The design and colors are fab with just the right amount of sparkle! Oh wow, I love the Thanksgiving day place cards the best. What a great idea. I've always wanted to make some place cards at family dinners to cut down on the confusion and people taking MY seat! LOL. Great projects! My Fav was the harvest blessing! Great details!